My smokin’ hot wife, Kay, and I had dinner a couple of nights ago with a great client who was in Seattle on business. We had a great time at one of our favorite restaurants, but the highlight of the evening was the unexpected personal connections we discovered. Actually, we discovered THREE completely different, yet amazing connections. 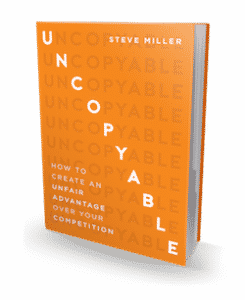 As I teach in my Amazon #1 best seller, UNCOPYABLE: How to Create an Unfair Advantage Over Your Competition, our big objective is to establish ATTACHMENT with our customers. And one of the best ways to get there is through personal attachment. Watch this week’s UNCOPYABLE Business video and get more details on how to make those great connections! We do biz w/ Orscheln also. We make custom cutting tools to them. I think part of their biz was bought by “Central State Ent.” out of Ohio. I will be @ IMTS also. I dont have the time nor $$ to do your seminars, but might bump into you in the crowd. Good luck.